“Of course.” replied the rabbit. “You can see the visible part of the mirror, as crayon, but the rest, let’s call it ‘not-mirror: you cannot see because it REFLECTS. “Does this mean that light bounces off the not-mirror part?” asked Alice. “And . . ,” encouraged the rabbit. “And that 90% is left for me to see my reflection?” cried Alice. “Why then, how much is left to reflect?” continued the rabbit. ‘Nature insists on the total of the mirror and not-mirror adding up to 100%,” explained the rabbit. “That’s one way,” said the rabbit as if he read her thoughts. 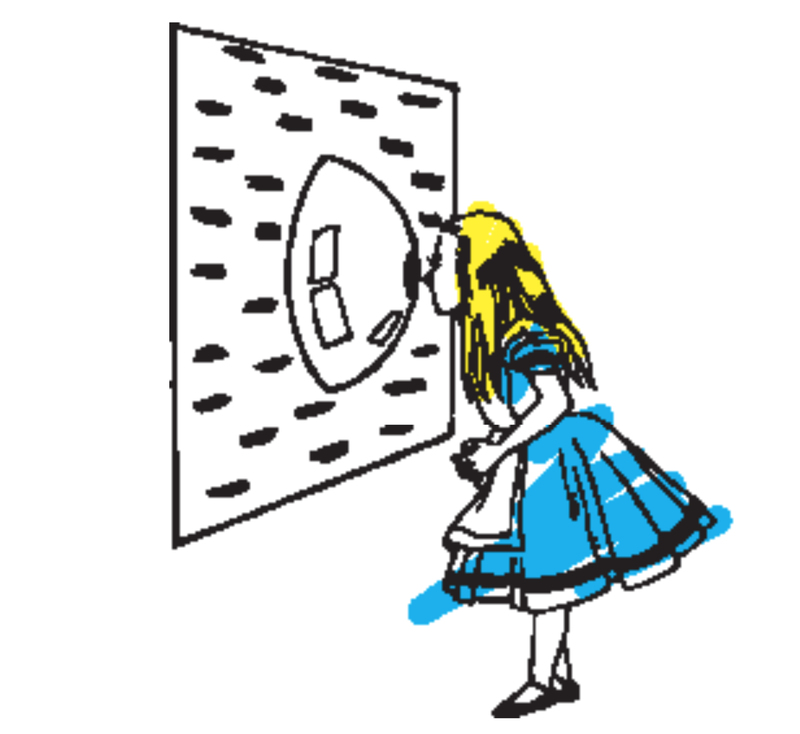 “But there is a better way, especially if you do not wish to disturb the mirror.” Alice was puzzled, reasoning that to see 100% mirror, she would have to see 0% not-mirror, and not be able to see herself at all! “It’s all done with mirrors!” exclaimed the rabbit with a twinkle in his eye. He then produced a hollow, shiny, metal beach ball (proving white rabbits are not only smart, but magical) which he proceeded to divide in half, and put a small hole in the center of one of them. Alice carefully peered into the hole and gasped at what she saw. “I see all 100% as crayon!” she cried. “The 90% of the mirror which is reflecting is continuing to reflect. However, the light which it reflects has as its source only the crayon dots. The light from the crayon dots is reflected by the beach-ball-half BACK to the mirror. If the light happens to hit a reflecting part, it reflects BACK to the beach ball again, and back to the surface. Eventually the light hits a crayon dot. Then it is absorbed and does not reflect. “When you look inside the hole, you see the result of zillions of reflections and absorption’s of light. The entire reflecting part of the mirror is covered, not by the crayon dots themselves, but by the REFLECTIONS OF THE CRAYON DOTS! “And that is why, my dear Alice, you see 100% of the crayon/mirror and 0% of anything else. For when we reach 100% of something, we can have 0% of not-something.” concluded the rabbit. “Well’ said the rabbit. “Light energy and heat energy are identical. Both follow the very same rules. The difference is that heat energy, sometimes called INFRARED, cannot always be seen by your eyes. You can sometimes feel it, such as when you place your hand near a hot stove. Most of the time a sensitive instrument, such as a MICROSCANNER™, is required. “All materials, like your mirror with crayon dots, will partly reflect and partly emit its own heat radiation. The part which is emitted because of its own heat is called EMISSIVITY. The part which is reflected from other objects nearby is called REFLECTIVITY. 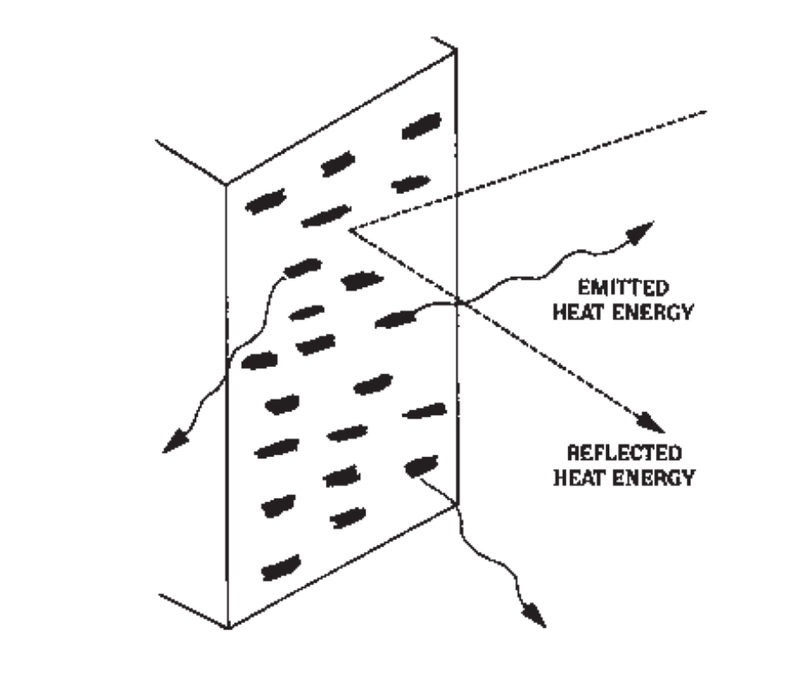 heat energy as if 80% of its surface were emitting at 100%. 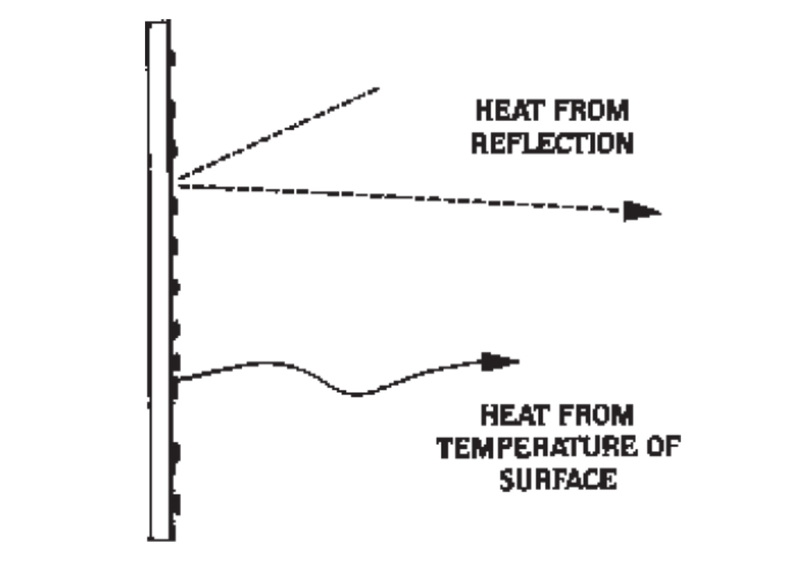 The remaining .2 reflectivity means that heat energy is reflected by 20% of the surface reflecting at 100%. 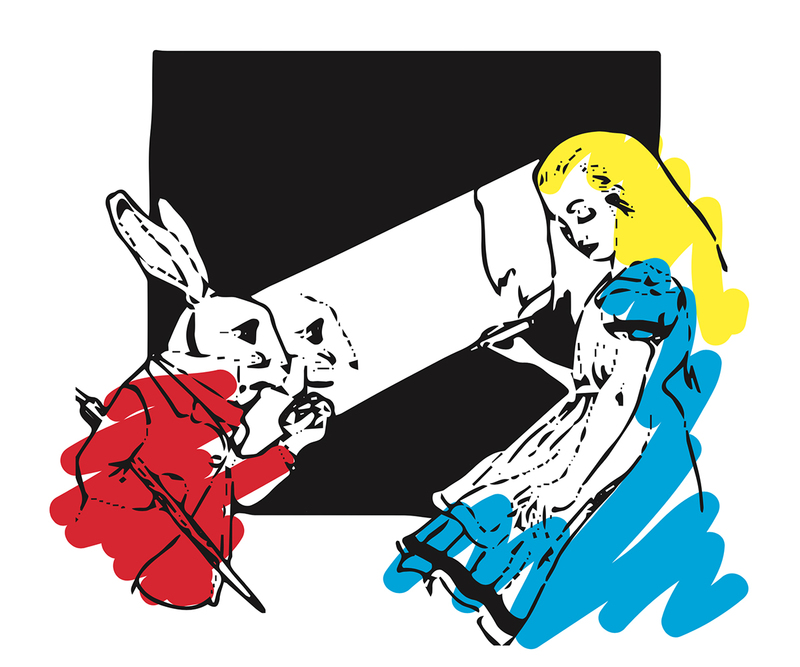 “So you see Alice, emissivity is not so mysterious. It is just the part of the surface that you can see, concluded the rabbit. 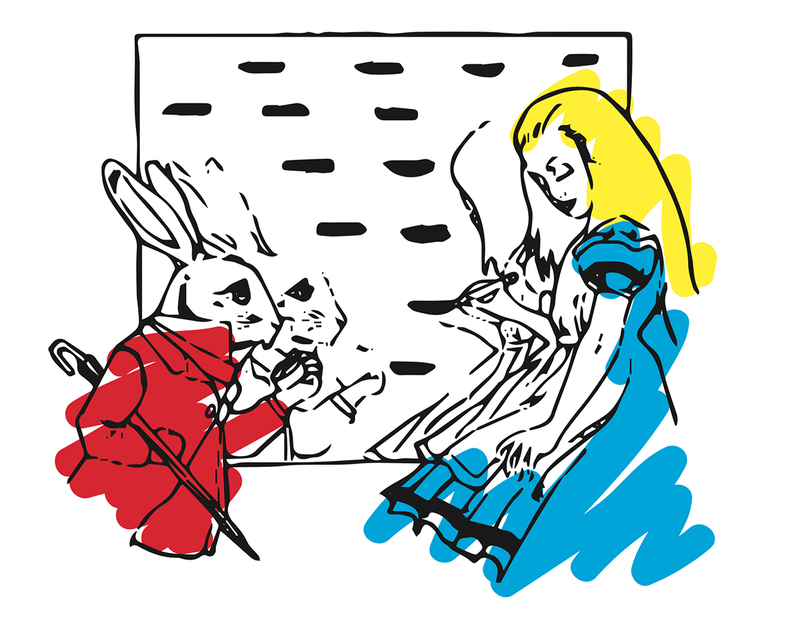 “Why that’s a very, very good question, Alice.” replied the rabbit, and he proceeded to explain. “One of the purposes of using infrared is to measure the temperature of surfaces—much, much more quickly than can be done by other methods. However, there was a nagging problem of EMISSIVITY. “The engineers at Exergen were gravely concerned with this problem, because their customers could not always know what the exact value of the emissivity is on any particular surface. “You see, Alice, if a sensitive instrument is ‘looking’ at a surface, it sees, like your eyes do, a combination of emitted and reflected heat radiation. Unless you know how many ‘crayon dots’ there are and what the reflections are, then you cannot know the temperature of the surface. “What you really want to know, to get temperature, is the average heat emitted by the ‘crayon dots: since they are really the surface. The reflective portion only tells you that the surface reflects—not what the surface is. “Therefore, the Exergen engineers, in designing the MICROSCANNER D-SERIES, had a bright idea-use a shiny beach-ball-half! They called it the Automatic Emissivity Compensation System (AECS), a rather complicated name. Most people just call it a ‘reflective cup’. “You see, Alice, the shiny, reflective cup on the D-series does the same thing that you saw in your mirror. 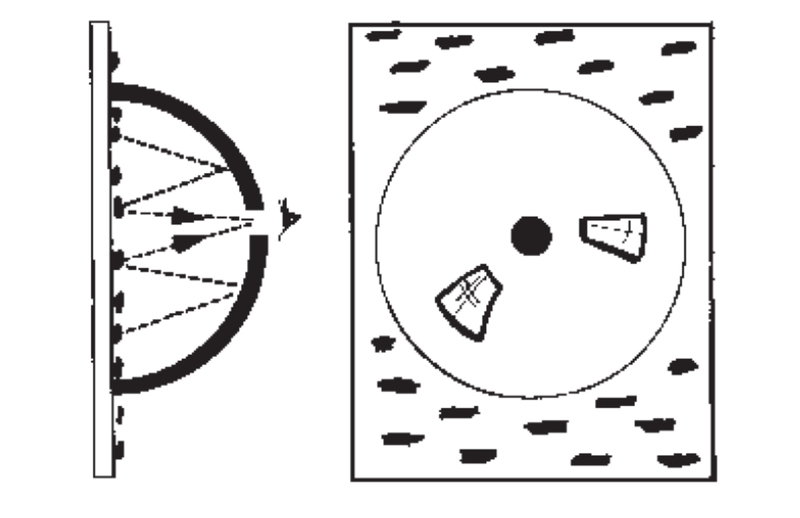 Instead of your eyes, a sensitive detector is used to look into the hole. “The heat emitted by the ‘crayon dots’ reflect and re-reflect until 100% of the surface is covered with the dots. Then the heat detector sees 100% dots and 0% not-dots. 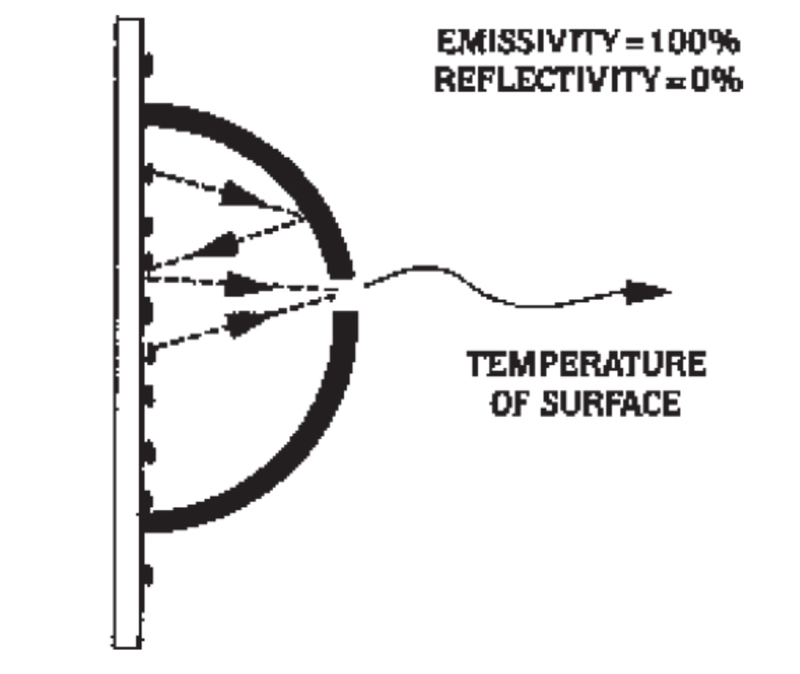 Therefore, the EMISSIVITY IS ONE. “With the emissivity at 1.0, Alice, an exact temperature may be calculated by the electronic circuits in the MICROSCANNER D-SERIES.” concluded the rabbit.